At the Name step of the wizard, specify connection settings for the VMware vCloud Director. If the VMware vCloud Director infrastructure comprises several cells, you can specify connection settings for any cell in the VMware vCloud Director hierarchy. 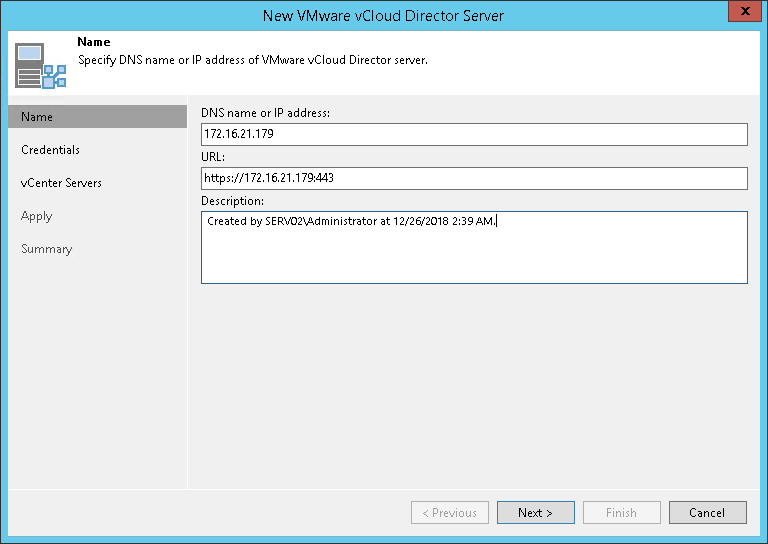 In the DNS name or IP address field, enter a full DNS name or IP address of the VMware vCloud Director server or any cell in the VMware vCloud Director infrastructure. where <vcdservername> is the name or IP address of the VMware vCloud Director server that you have specified in the field above and 443 is the default port for communication with VMware vCloud Director. In the Description field, provide a description for future reference. The default description contains information about the user who added the server, date and time when the server was added.